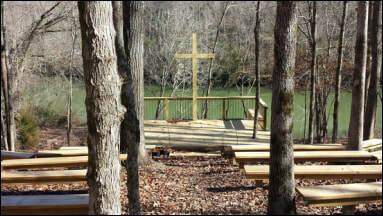 Living River would love to host your retreat! 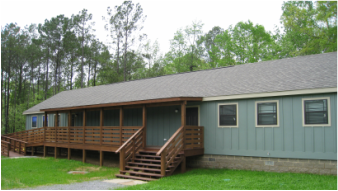 Living River: A Retreat on the Cahaba, is located on 440 acres in Bibb and Shelby Counties, surrounded on three sides by 4.5 miles of the Cahaba River The property tells an amazing story of Alabama’s natural and cultural history over time. From Native American artifacts to reclaimed coal mine sites to an ancient river teeming with life, visitors can trace the cultural history of the Cahaba and experience the resiliency of nature first-hand. 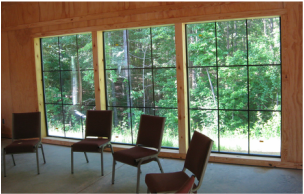 We at Living River strive to create a space for groups to come out and have a retreat, in a way that is as simple as possible for you! Our hosts ensure that all of your meals are ready on time, all the materials that you may need are ready for you and that your gathering spaces are clean and functional. 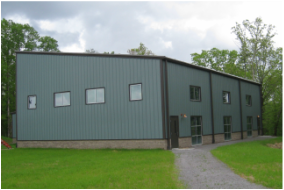 Take a look at our facilities down below to see if we fit your needs! Contact office@livingriver.org to start planning your retreat! 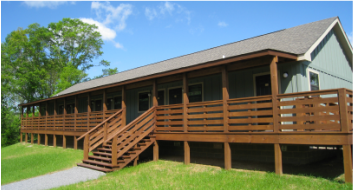 The facilities on-site include climate-controlled, fully accessible lodging and meeting space with three duplex cabins that can house 108 student/chaperone guests, and seven motel-style rooms designed primarily for adult guests, including teachers and professors. The dining hall, situated high on a scenic bluff overlooking the Cahaba River, offers a great location for meetings, conferences, and various other events. The site also has two canoe launches, multiple picnic areas, and hiking trails throughout the property.